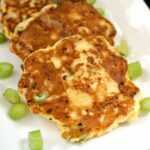 Tender Low-Carb Chicken Fritters Recipe, a delicious and healthy appetizer, totally kid friendly. Ready in well under 30 minutes, super easy to make. I am back with yet another chicken recipe, this time some seriously delicious chicken fritters. 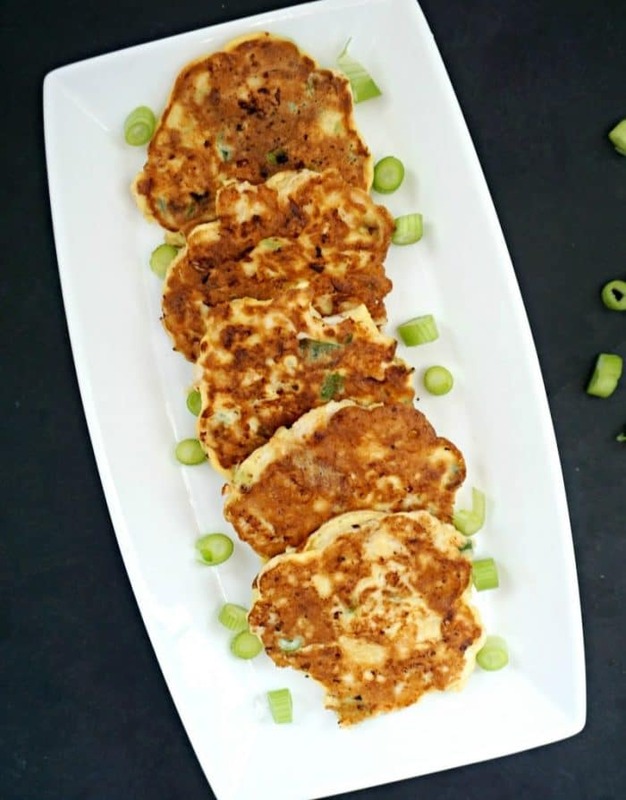 Vegetable fritters are probably more popular, especially in summer time when there is an abundance of seasonal vegetables. If you need a nice dip to go with the fritters, I would recommend something light or simple, maybe just the good old ketchup, or a cucumber and yogurt dip, or aioli sauce. I actually thought they were pretty nice without any dip, but I know some people would rather have a nice dip at the table. You really don’t need too many ingredients, keep it as simple as possible, they taste great. If you want to go for the baby-friendly version, salt will be omitted, other than that, just add some to taste, I wouldn’t add more than a quarter of a teaspoon of salt. I think ever since I have started the solids with my little ones, my taste buds have changed massively. WHAT IS THE DIFFERENCE BETWEEN PATTIES AND FRITTERS? Do you know what I like best about these chicken fritters recipe? You only need a few drops of oil, especially if you have a good non-stick frying pan, which is always a life-saver no matter what you cook. 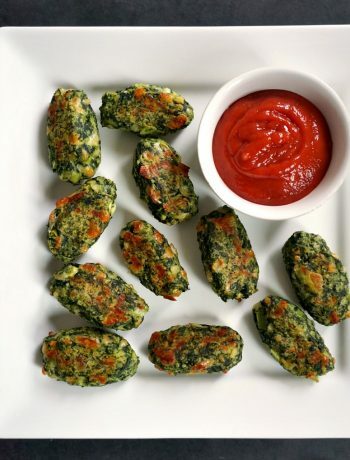 Unlike patties, which need a tad more oil so they can fry evenly, with fritters there is absoutely no need for more. So, since patties have been brough into discussion, WHAT IS THE DIFFERENCE BETWEEN PATTIES AND FRITTERS? Firstly, as mentioned already, pattied have a firmer consistency in order to be shaped nicely, they are usually coated either with plain flour or breadcrumbs, and need to be fried in a lot more oil, to ensure an even cooking. 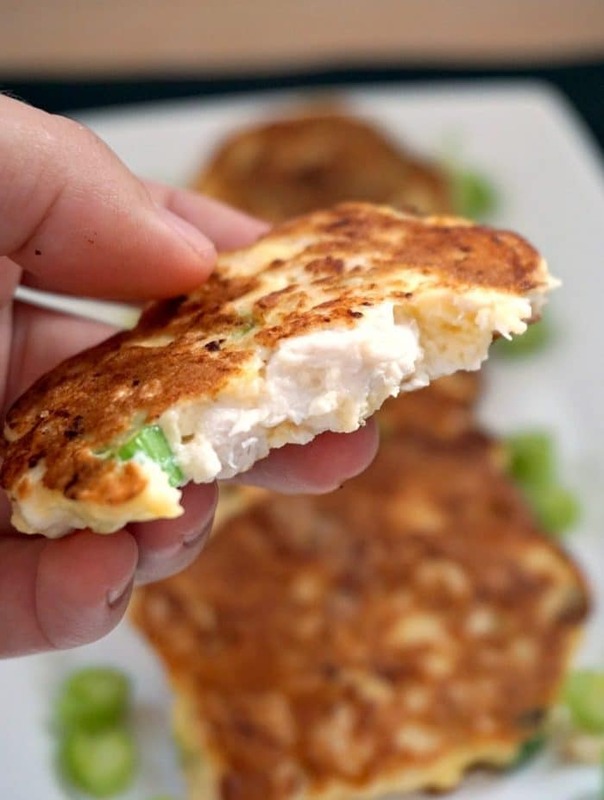 You can see some examples of how to make patties with these two delicious recipes: Mashed potato tuna patties recipe and Chickpea potato broccoli patties. Patties have a softer consistency, like a batter, they can just be dropped in the pan with the help of a spoon, and need little oil. They don’t need to be refrigerated beforehand, and can be cooked straight away. Either way, the choice of ingredients for both patties and fritters is endless, you can go for whatever you like. I find that fritters are best consumed straight away while they are warm, where patties can be served cold as well. It might just be personal choice, but I thought I would mention that anyway. Now, chicken breast is usually the obvious choice for making fritters, but I don’t see why chicken thights can’t be used. To make the chicken fritters even more flavourful, you can used freshly-chopped dill or parsley, this time I only used spring onions, and they were lovely like that too. To ensure a quick and even cooking, the chicken breast has to be cut up in really small cubes. In this way they will be nice and tender, and ready in just under 2-3 minutes each. Don’t overcrowd the pan, I never make more than 4 fritters at the same time, it’s a lot easier to flip them on the other side in this way, plus they cook better. I find that the same applies for patties too, and anything else that needs to be cooked in a frying pan. 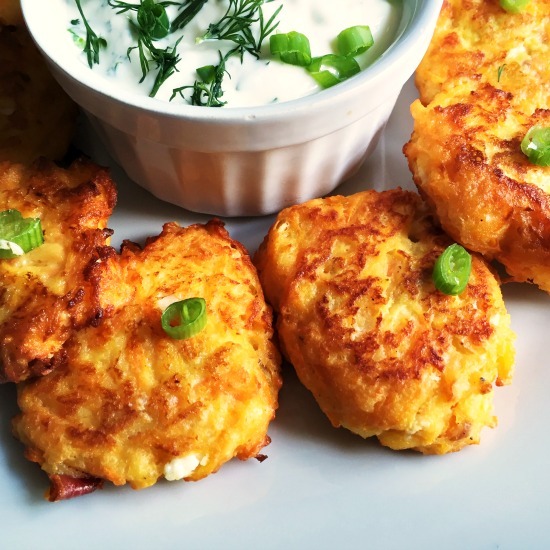 I really liked these fritters, and will definitely make them again, it’s an easy recipe that goes well with the whole family, picky eaters included. Great as an appetizer or a healthy snack whenever you are peckish. A keto friendly recipe. 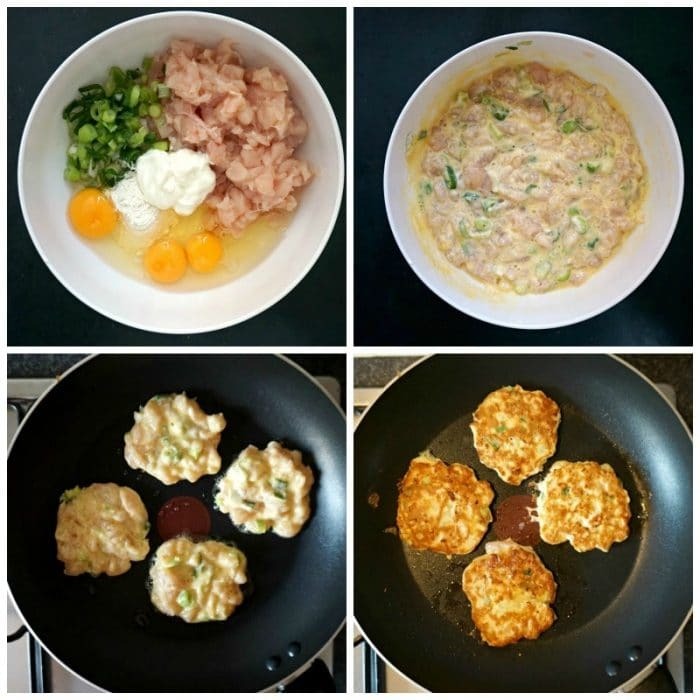 If you’ve tried my TENDER CHIKEN FRITTERS RECIPE or any other recipe on the blog then don’t forget to rate the recipe and let me know how you got on in the comments below, I love hearing from you! You can also FOLLOW ME on FACEBOOK, and PINTEREST to see more delicious food and what I’m getting up to. Tender Chicken Fritters, a delicious recipe that is totally kid-friendly. Easy to make, ready is well under 30 minutes. 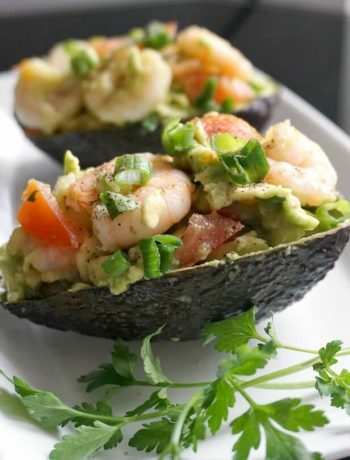 Great as an appetizer or a healthy snack. Low carb, keto. Cut the chicken strips into small cubes and add them to a bowl. Chop the spring onions finely and add them to the same bowl, together with the eggs, sour cream and flour. Season to taste, then mix well to form a soft, batter-like consistency. Heat up a frying up, add a few drops of oil at a time, and use a spoon to drop batter into the frying pan, like small nests or pancakes. Fry on both sites for about 2-3 minutes until cooked through, then remove from the pan and place on a plate that had been lined with kitchen towel. 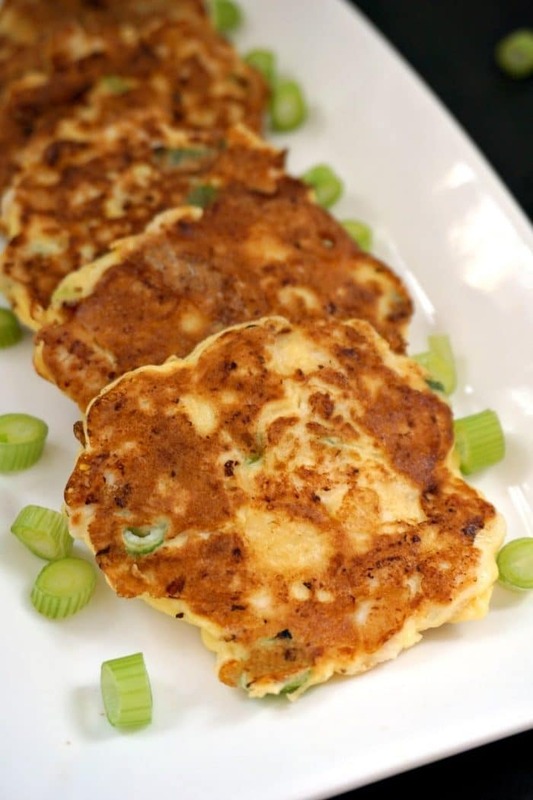 Please see the post for more tips about making the fritters. Click on the number of servings and adjust it to the number of servings you would like, the amount of ingredients used will change accordingly. Click on US Customary if you would like the measurements displayed in cups/ounces. Hello, what is the service size per serving, is the nutrition for 1, 2, or 3 fritters at one time? Thank you for your comment! The nutrition info is for one fritter only.